Albrecht Dürer’s “Madonna of the Rose Garlands,” a resplendent painting of Mary and the Christ Child surrounded by prominent personages of the early 16th century, is one of the great treasures of the National Gallery in Prague. A large altarpiece completed in 1506 as a commission for the German church of San Bartolomeo in Venice, it shows Mary seated in majesty with a golden crown held over her head by two cherubs and her son seated on her lap. She is placing a crown of roses on the head of the kneeling Holy Roman Emperor Maximilian I to her left, while Jesus reaches friskily to his mother’s right to place an identical crown on the likewise kneeling Pope Julius II. Other religious figures are gathered on the pope’s side, including Antonio Soriano, the Patriarch of Venice, Burkhard von Speyer, the superior of San Bartolomeo, and St. Dominic, crowning a bishop with roses. The landscape behind Dominic is brought forward toward the viewer. On the emperor’s side, it reaches back to a luminous Alpine view, with Dürer portraying himself prominently in the foreground not far from the architect Hieronymus of Augsburg, who wears a pale blue robe. Centered at the bottom of the picture is a musical angel, a clear tribute to Giovanni Bellini, the master of his time, whose “San Zaccaria Altarpiece” of 1505 featured just such an angel in just such a place in the composition. Although the painting has been damaged by numerous restorations, “in one propitious moment,” as the great art historian Erwin Panofsky wrote, Dürer’s gleaming altarpiece still succeeds “in synthesizing the force and accuracy of his design with the rich glow of Venetian color.” To the solemn, serene monumentality of Bellini it adds a cast of natural, individualized figures and a dramatic sense of movement. And we viewers are invited to be part of the ceremony, which is more properly called “The Feast of the Rosary”—the crowns of roses being symbols of the rosary, for which a special brotherhood had been established in Venice by Leonard Vilt. Here we are at the moment where the Quattrocento passes to the Cinquecento, not simply chronologically but stylistically, and the High Renaissance is at hand. No wonder the doge of Venice, the patriarch, any number of nobles and very likely Bellini as well thronged to Dürer’s studio on hearing the great work was finished. Needless to say, this is not a Christmas or Nativity painting as such. It stands in the lineage of paintings of Mary and her infant son accompanied by saints and presented in handsome architectural spaces that goes back at least to Fra Angelico’s “Annalena Altarpiece” (c. 1435), becomes enchantingly vivid in Flemish paintings like Hans Memling’s “Virgin and Child With Saints Catherine of Alexandra and Barbara” (1479) and develops into ever more natural groupings of mother, son and relaxed saint-companions known as sacra conversazione. 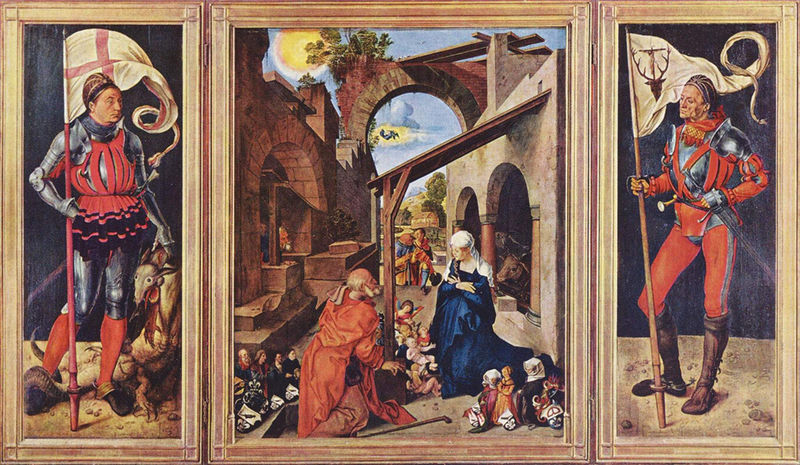 Related to these paintings is the special iconographical theme of the Rosenkranzbild, or rosary picture, which was especially popular in Germany. For a conventional nativity scene we should turn to Dürer’s earlier “Paumgartner Altar” (c. 1500), a triptych whose central panel charmingly shows the Christ Child in a crib of cherubs between Joseph and Mary. But what of the little donor figures in the painting, crowded to the left and right of the Holy Family? And the large left panel depicting St. George and the similarly high right panel depicting St. Eustace? Well, St. George is a portrait of Stephan Paumgartner and Eustace a portrait of his brother Lukas, while the smaller folk are other members of the Paumgartner family, who commissioned the altarpiece. Of course they had to be there. Most of us are used to the convention of (smaller) donor portraits appearing in Renaissance painting. They are devotional tributes, of course. But what else do they tell us about the actual, historical birth of Jesus and the contemporaries of the artists who depicted the birth? It is the birth the artists paint, not the incarnation as such. That took place through the whole time of Jesus’ life as he became fully human, a process completed (“It is finished”) only with his death on the cross. But what is the fuller meaning of Angelico’s early saints with Francis of Assisi in the “Annalena Altarpiece,” Catherine and Barbara in the Memling, Stephan and Lukas Paumgartner towering (as they do) over Mary, Joseph and the infant, the pope and the emperor seeking to kneel before and be crowned by the mother and the child? It cannot be the denial or collapse of the time between Jesus and the saints, canonized or not, who venerate him. Incarnation, God’s pitching his tent with us through the Word made flesh, is a radicalization of time’s value, not its denigration. What is this eternity that dwells in our every now? It is not an endless time to come after our passing time. It is, rather, what God is—absolute reality and life without change. We have no positive conception of it, but instead a negative concept. As we say with St. Thomas Aquinas, we know that God is but not what God is, so we know that eternity is but not what eternity is. The classic definition of Boethius—eternity is the perfect possession of endless life held wholly all at once—directs our thought in the right direction, but without defining the goal. And when we speak of an afterlife, what we properly mean is eternal life, more promising by far if also more mysterious. We may thus say, with the prologue of John’s Gospel: “The Word became flesh and dwelt among us,” or: the eternal Word became the flesh of time, opening our time and his (the same) to his eternity promised as ours. For early Christian writers, as Hugo Rahner, S.J., has shown, there was a strong sense that as the Word was born eternally in the bosom of the Father and became flesh in the womb of Mary, so too he was born from the heart of the church and the faithful. And it became common for the three Masses of Christmas—of the night, of the dawn and of the day—to be seen as symbolizing a threefold birth of Christ: eternally in the Father, from the womb of the Virgin Mary and mystically in the souls of the faithful. It would be hard to state the incarnational union of time and eternity more forcefully than this. Yet it is the inner meaning of great paintings like those Rembrandt has given us of the Christ Child with his parents or Velázquez of the Wise Men worshiping him. In both, God is with us as incarnate Word, delightful in the simplest human appearance and yet drawing us through time toward the radiant, imperishable presence of eternity—now as Rembrandt shows Mary playing with her child in his cradle, now as Velázquez shows her holding him on her lap for the Magi’s wonder. It would be centuries before art of such power found means again to address the true mystery of the eternal in time. Sentimental conventions and academic formulas had to be set aside. Fresh eyes, and not always those of faith, were needed to imagine what was at once too simple and too profound for a too comfortable art. But Paul Gauguin, for example, in his Tahitian version of the annunciation, took the now shop-worn story, merged it with the theme of the madonna and child, added two surprised observers—and gave us “La Orana Maria” (1891). In the wondrous colors of the islands, Mary is now a sturdy Tahitian girl whose son, perhaps 2 years old, sits on her shoulder, his head nestled against hers. An angel is hidden nearby in a flowering bush. And two women wonder what this all means. We see again. Or the great African-American painter Romare Bearden ponders how the eternal now of the Christ child and his mother can be imagined, takes the treasured Russian icon of the “Virgin of Vladimir” (early 12th century) and reinterprets it as a black madonna and child. Still more inventively, in his “Adoration of the Magi,” a painting from his 1945 “Passion of Christ” series, Bearden shows us Mary and the child in the middle of the picture, with the Magi on either side. He uses a richly hued, prismatic cubism, more gripping than any easy “realism,” to suggest the mystery of all natural wisdom bowing to eternal wisdom. We are held in the now that, even more than entering into time, draws all time toward it. Now—at Christmas, as always, Christ is present. But at Christmas, celebrating his birth, amid all the family joy and gift-giving, troubled also by the sorrows of our day, as Mary and Joseph undoubtedly were by theirs, we have a date for what ultimately transcends all dates, God’s Word among us to draw us through his Spirit to himself. Let us praise the artists who have helped, and pray God will in the future help us again, to imagine this mystery of all mysteries. The antiphon for the Magnificat in Evening Prayer on Christmas Day reads, Hodie Christus natus est: “Today Christ is born.” Today—forever. This article also appeared in print, under the headline "Holy Framing," in the December 21-28, 2015 issue. Leo J. O’Donovan, S.J., is president emeritus of Georgetown University, Washington, D.C.